Nagasaki. Laid down at Mitsubishi Heavy Industries, Ltd. shipyard. Completed and registered in the IJN. At 1200 departs Nanao on an anti submarine training exercise. At 1100 arrives at Maizuru. Remains at Maizuru for most of month. At 0800 departs Maizuru on a training exercise. At 1930 arrives at Chinkai. Tsushima Strait. CD-194 and CD-198 are damaged by aircraft at 34-42N, 130-13E. CD-194's crew is informed of the cessation of hostilities with the Allied Powers. Departs Sasebo on her first repatriation voyage. Arrives at Manila and departs later that day. Arrives at Davao. Embarks troops and passengers to be repatriated and departs later that day. Arrives at Tacloban. Embarks troops and passengers to be repatriated. Arrives at Kagoshima. Disembarks troops and passengers. Arrives at Manila. Embarks troops and passengers to be repatriated. Arrives at Miyakojima. Embarks troops and passengers to be repatriated. Arrives at Otaka. Disembarks troops and passengers. Arrives at Kirun (Keelung). Embarks troops and passengers to be repatriated and departs later that day. Arrives at Kasado Dockyard for repairs. Arrives at Kirun. Embarks troops and passengers to be repatriated. Arrives at Kwaren (Hua Lien). Embarks troops and passengers to be repatriated. Arrives at Kwaren. Embarks troops and passengers to be repatriated. Enters dockyard at Kure for repairs. Arrives at Shanghai. Embarks troops and passengers to be repatriated. Departs Kagoshima. Disembarks troops and passengers. Enters Kawaminami Dockyard at Koyagijima for repairs. Shanghai. Ceded to he Republic of China as a war reparation. Renamed WEI HAI. Yangtze River. WEI HAI is wrecked by communist army fire. Later, she is repaired by the Chinese Communist People’s Republic of China and joins its navy service. Name changed to JINAN and given serial number 217. Allied occupation forces were responsible for the return of six million Japanese military personnel and civilians from Japan's defunct far-flung Empire. In addition, there were over a million Korean and about 40,000 Chinese prisoners and conscript laborers and approximately 7,000 Formosans and 15,000 Ryukyu Islanders to be repatriated. Some Allied and many former IJN warships, from aircraft carriers to kaibokan, were used to facilitate the enormous repatriation effort. 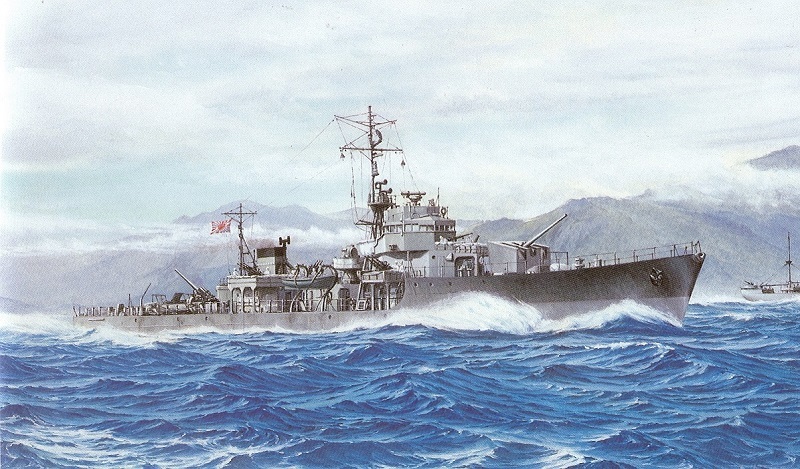 Japanese vessels and crews were used to the fullest extent possible to conserve Allied manpower and accelerate demobilization. Each ex-IJN ship first had to be demilitarized; guns removed or, in the case of large warships, barrels severed, ammunition landed, and radar and catapults removed, if fitted. Repatriation of the Chinese on Japanese ships began early in October from Hakata, but U.S. guard detachments had to be placed on many ships to prevent disorder because the Japanese crews could not control the returnees. Japanese-run repatriation centers were established at Kagoshima, Hario near Sasebo, and Hakata near Fukuoka. Other reception centers were established and operated at Maizuru, Shimonoseki, Sasebo, Senzaki, Kure, Uraga, Yokohama, Moji and Hakodate. Allied line and medical personnel supervised the centers. Incoming Japanese were sprayed with DDT, examined and inoculated for typhus and smallpox, provided with food, and transported to his final destination in Japan. Thanks go to Dr. Higuchi Tatsuhiro of Japan and Mr. Gilbert Casse of France.